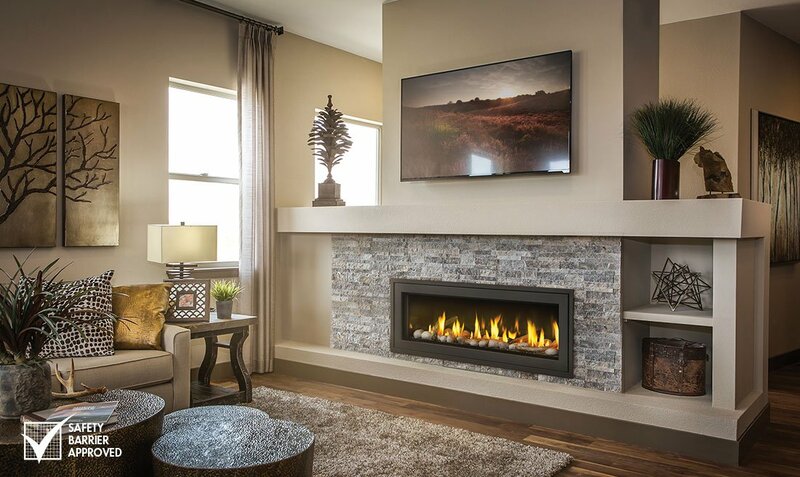 The Napoleon Vector	™ 50 Gas Fireplace is second to none. Relax in front of 799 in² of	fireplace viewing area while up to 40,000 BTU’s of heat fills your	room with the comforting glow of the Divinity	™ flame pattern. The LED ember bed allows you to instantly set the mood. Create any feel, any look, any color of ember bed you wish and control	it all with Napoleon’s	Bluetooth	® enabled	eFIRE app directly from your mobile device. Aside from the infinite choices	of LED colors for your emberbed, the	eFIRE app also allows you to control flame height, blower and a pulsating emberbed	LED pattern. Need to add some modern flare to a room in your house? With the	Napoleon LV50N Vector 50 Direct Vent Gas Fireplace you can achieve just that! The new Divinity™ flame pattern provides	a full and luxurious linear fireplace experience. Take full control of	your atmosphere with the Bluetooth enabled eFIRE app which allows you	to control your flames, blower, and LED colors all from the convenience	of your smart phone! The included LED ember bed, especially when paired with one of the optional	River Rock media kits, adds a beautifully radiant glow. Sporting stunning	display options, built-in safety features, the	Napoleon LV50N Vector 50 Direct Vent Gas Fireplace will bring a magnitude of luxury to your home. So sit back and enjoy the	40,000 BTUs of heat output as you allow this fireplace to redesign ambiance	in your home!